Cliffe FC Sundays progress to the next round of the YSML Challenge Cup, but Cliffe FC Reserves lose 3-1 away at Skirlaugh in County Cup – a mixed cup weekend for the Oxen Lane club. 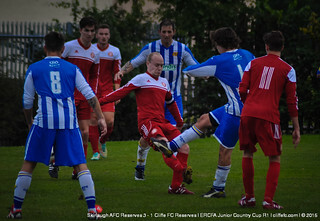 Cliffe FC Reserves do not join their First Team in the next round of the East Riding County Cup, after a 3-1 away loss at Skirlaugh AFC. As can be the case with County Cup away days, Cliffe made the long trip to Skirlaugh on Saturday afternoon. Skirlaugh, who currently sit at the top of County League Division Four, took the lead from close range after 10 minutes, 1-0. Cliffe never really got going, and struggled to make anything happen in the final third – to compound things, the home side doubled their lead before the break to make it 2-0 at half-time. 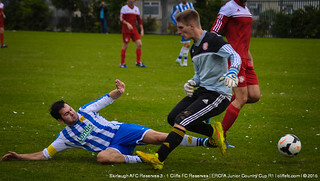 Cliffe needed to respond early in the second-half, but it was Skirlaugh that continued on-top and pounced on a slight miscommunication to got 3-0 up. Cliffe changed formation to a 3-4-3 in search of goals – lack of goals evident through-out Cliffe Reserves this season it seems. Cliffe got themselves a lifeline with a quarter-hour left to play, Harri Summerscales staying alert in the box to crash a shot past the ‘keeper for 3-1. Cliffe found themselves on the wrong-side of a pair for offside calls late-on that probably could’ve seen Cliffe back into the tie, but Skirlaugh qualify for the next round as the final whistle went, 3-1 FT.
Cliffe FC Reserves have to dust themselves off, and focus on league compeitition now – next Saturday they host Poppleton Reserves at Oxen Lane. Cliffe FC first team are also back in league action next Saturday – away to Tockwith. Another eventful meeting between Cliffe FC and Selby Olympia on Sunday morning, away side Cliffe triumphing 5-3 to go through to the next round of the Challenge Cup – Tom Collins’ brace the pick of the goals, both from the half-way line. A high-tempo beginning of the match saw both sides have half-chances, Cliffe needing to clear off the line three times in the matter of seconds to stop the home side opening the scoring. It was Cliffe captain Mark Bennett that opened scoring, a driven-shot from outside the box that arrowed into the bottom corner – a rare, and special, opener – 0-1. A superb counter-attack saw Cliffe double their lead, an Olympia attacking set-piece breaking down, which lead to Nathan Horner, Kev Taylor and Andy Kirkham breaking forward and eventually saw Nathan Parker, Parker also playing a part in the slick passing move, slotting the ball under the ‘keeper for 0-2 – a nice team goal. 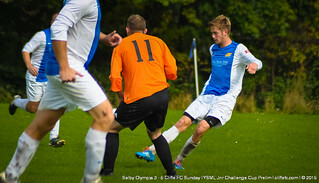 In the space of 90-seconds, Olympia found themselves back into the game and then two-goals-down again – first Olympia made it 1-2, Chris Coxon the scoring having seemingly broke the offside trap. But then Cliffe went 3-1 ahead, Tom Collins lobbing the ‘keeper directly from kick-off to restore the away side’s two-goal cushion at the half-time break, 1-3 HT. An excitable Jackson Lucitt (Welsh-man Lucitt still buzzing from his national team’s Euro 2016 triumph the evening before) rallied his men and sent them back out for the second-half. It didn’t go exactly to plan for Cliffe as Olympia got the opening goal of the half, Matty Howden scoring from close-range to make it 2-3. 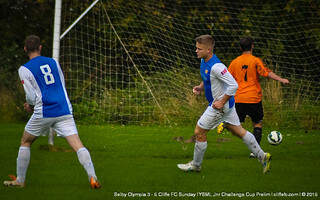 A nasty clash of head’s saw Olympia reduced to 10-men as the home side had no substitutes available – but Olympia did draw level soon after, an individual effort from Coxon saw him squeeze the ball into the net for 3-3, game on. With plenty of time left in the tie, it looked likely that Olympia would tire and Cliffe just had to stay patient but be wary of being caught out as Ally Harris was called upon to make a save from close range. The final pair of goals fell the way of the away side to seal the win, Parker breaking the offside trap to hold off the last defender to slide the ball past the ‘keeper to make it 4-3 to Cliffe, Andy Kirkham with the assist. Collins then scored another long-range lob – a cross-field lob from near the half-way line that was inch-perfect under the crossbar to make it 5-3 to Cliffe, Dan Richardson with the assist. 5-3 was the final score and Cliffe go through to the next round – also has to be noted the superb level of support on the Cliffe touchline on Sunday morning, a great showing for the Oxen Lane club. Cliffe FC Sunday are without a fixture next Sunday, and are scheduled to be back in action on Sunday 25th October, at home to Grange FC in County Cup competition – the cup games just keep coming!